Hosted for our pals at Fabric Rocks. This listing is for Fabric Rocks' designs that are not yet available for public purchase (or that require customization) via Spoonflower. 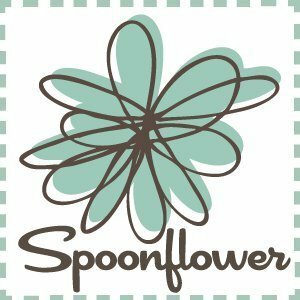 Orders ship directly to the buyer from Spoonflower. Once the order ships, the design can be made available for public purchase for subsequent orders. At this time, fat quarters are not available for this listing. Quantities are full yards only. Basic Cotton Ultra: 100% natural combed cotton fabric with a simple, versatile construction. Perfect for craft projects, quilting, lining apparel and bags, home decor, and soft toys and accessories. Printable width: 42 in (107 cm); 3.2 oz per square yard (103 gsm); Natural White; Estimated shrinkage: 3-4% in length and width. Satin: 100% polyester satin fabric with a silky feel and high-gloss finish. Perfect for lining apparel and bags, wedding decor, and soft, silky accessories. Printable width: 54 in (137 cm); 2.2 oz per square yard (80 gsm); White; Estimated shrinkage: 1-2% in length and 0-1% in width. Kona® Cotton Ultra: 100% natural combed cotton fabric with a wide weave that's great for quilting. Perfect for quilting, appliqué, shirting, dresses, children's clothing, and home decor. Printable width: 42 in (107 cm); 4.5 oz per square yard (107 gsm); White; Estimated shrinkage: 2-3% in length and 4-5% in width. Cotton Poplin Ultra: 100% natural cotton fabric with a fine weave and crisp, smooth feel. Perfect for quilting, shirting, skirts, dresses, pajamas, and home decor. Printable width: 42 in (107 cm); 3.7 oz per square yard (110 gsm); White; Estimated shrinkage: 5-6% in length and 3-4% in width. Performance Piqué: 100% polyester knit fabric with a diamond weave structure and a moisture-wicking, soil release finish. Perfect for yoga tops, polo shirts, sporty dresses and skirts, and headbands. Printable width: 56 in (142 cm); 4.5 oz per square yard (145 gsm); Optic White; Estimated shrinkage: 1-3% in length and 1-2% in width. Chiffon: 100% polyester chiffon fabric with a translucent look and delicate drape. Perfect for scarves, sheer curtains, and special occasion decor items. Printable width: 54 in (137 cm); 1.5 oz per square yard (51 gsm); Non-optic white; Estimated shrinkage: 0%-1% in length and width. Organic Sweet Pea Gauze: 100% organic cotton double gauze fabric that crinkles in the wash. Perfect for swaddle blankets, bibs, burp cloths, and reusable bags. Printable width: 56 in (142 cm); 3.2 oz per square yard (108 gsm); Non-optic white; Estimated shrinkage: 14% in length and 8% width; Certified organic cotton by Global Organic Textile Standards (GOTS); Prints are likely to be off-grain. Poly Crepe de Chine: 100% polyester crepe de chine fabric with a semi-sheer look and delicate drape. Perfect for blouses, dresses, semi-sheer curtains, and lingerie. Printable width: 52 in (132 cm); 1.9 oz per square yard (88 gsm); White; Estimated shrinkage: 0-1% in length and 1-2% in width. Silky Faille: 100% polyester fabric with a slinky feel and matte finish. Perfect for pillows, dresses, blouses, and scarves. Printable width: 54 in(137 cm); 4.4 oz per square yard (150 gsm); Optic White; Estimated shrinkage: 1-2% in length and 0-1% in width. Performance Knit: 100% polyester fabric with a slight sheen and moisture-management properties. Perfect for athletic apparel, tops, dresses, and headbands. Printable width: 56 in (142 cm); 4.1 oz per square yard (138 gsm); Optic white; Estimated shrinkage: 1-2% in length and 2-4% in width. Lightweight Cotton Twill: 100% natural cotton twill fabric with a with a sturdy, drapable construction. Perfect for home decorating including drapery, table linens and pillows, banners, tote bags, pants, coats and jackets. Printable width: 58 in (147 cm); 5.6 oz per square yard (195 gsm); White; Estimated shrinkage: 4-6% in length and 1-2% in width. Modern Jersey: 95% polyester, 5% spandex jersey knit fabric with plenty of stretch and a cotton-like feel. Perfect for t-shirts, dresses, headbands, scarves, and children's apparel. Printable width: 56 in (142 cm); 6.5 oz per square yard (210 gsm); White; Estimated shrinkage: 2-4% in length and 0-1% in width. Cotton Spandex Jersey: 93% natural cotton, 7% spandex jersey knit fabric with plenty of softness and stretch. Perfect for adult and baby apparel and loungewear. Printable width: 60 in (152 cm); 5.5 oz per square yard (190 gsm); 4-way stretch: 55% in length and 70% in width; White; Estimated shrinkage: 7-10% in length and 1-3% in width. Fleece: 100% polyester low-loft fleece fabric with a slight stretch and soft, cuddly feel. Perfect for adult and youth loungewear, blankets and pillows, soft toys, and cool weather apparel. Printable width: 56 in (142 cm); 6.2 oz per square yard (230 gsm); Optic white; Estimated shrinkage: 1-2% in length and 0-1% in width. Linen Cotton Canvas Ultra: 55% linen, 45% natural cotton fabric with a versatile medium weight and textured feel. Perfect for tablecloths, tea towels, dresses, bags, and pillows. Printable width: 54 in (137 cm); 6.2 oz per square yard (215 gsm); Natural white; Estimated shrinkage: 3-5% in length and 0-3% in width. Organic Cotton Sateen Ultra: 100% organic cotton fabric with a subtle sheen and soft hand. Perfect for shirting, dresses, ties and pocket squares, and lightweight home decor. Printable width: 56 in (142 cm); 3.8 oz per square yard (130 gsm); Optic white; Estimated shrinkage: 3-4% in length and width; Certified organic cotton by Global Organic Textile Standards (GOTS). Minky: 100% polyester minky fabric with a soft, napped finish for the ultimate in plush. Perfect for blankets, lounge wear, and cold weather accessories. rintable width: 54 in (132 cm); 6.1 oz per square yard (220gsm); White; Estimated shrinkage: 1-2% in length and 1-3% in width. Sport Lycra: 88% polyester, 12% Lycra knit fabric with a stretchy, sturdy construction and moisture-wicking finish. Perfect for athletic apparel and swimwear. Printable width: 56 in (142 cm); 8.4 oz per square yard (290 gsm); 4-way stretch, 75% in width and 50% in length; Optic white; Estimated shrinkage: 1-3% in length and 0-1% in width; Colorfast to chlorinated and salt water. Eco Canvas: 100% polyester canvas fabric with 45% recycled content and a sturdy construction. Perfect for upholstery, bags, home decor, outdoor pillows, toys, play mats, and jackets. Printable Width: 54 in (137 cm); 8.7 oz per square yard (270 gsm); Produced in the U.S.; Estimated shrinkage: 0-1% in length and 1-2% in width; Testing is recommended for applications where the printed fabric will be exposed to heavy abrasion (rubbing). Celosia Velvet: 100% polyester velvet fabric with a short pile and subtle shimmer. Perfect for home decor and commercial-grade upholstery, heavyweight apparel, and luxurious accessories. Printable width: 54 in (137 cm); 10.9 oz per square yard (370 gsm); Non-optic white; Estimated shrinkage: 5-6% in length and 2-3% in width. Faux Suede: 100% polyester napped fabric with a soft, luxe feel and stain-resistant finish. Perfect for bags, upholstery, pillows, and structured clothing. Printable width: 54 in (137 cm); 7.5 oz per square yard (245 gsm); White; Estimated shrinkage: 1-3% in length and 0-2% in width; Testing is recommended for applications where the printed fabric will be exposed to heavy abrasion (rubbing). Dogwood Denim: 100% natural cotton bull denim with a rugged twill construction. Perfect for skirts, shorts, pants, outerwear, bags and backpacks, and low-traffic upholstery. Printable width: 56 in (142 cm); 11.6 oz per square yard (393 gsm); Natural white; Estimated shrinkage: 7-8% in length and 1-2% in width. For orders > 20 yds of any single design, please contact Fabric Rocks via Spoonflower message for discount options. For wallpapers or gift wrap, please contact Fabric Rocks via Spoonflower message.